I had a wonderful day visiting my friend and Pretty Pal, Patti. 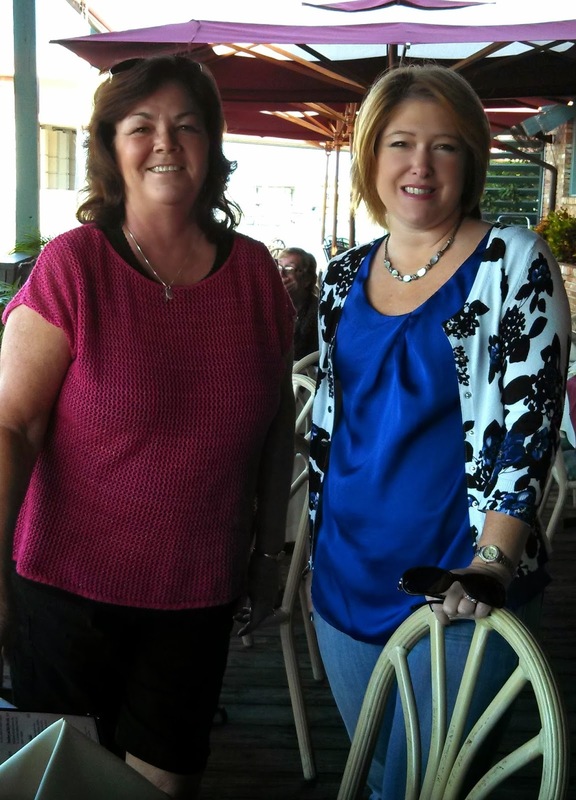 We had a great lunch on the river in New Smyrna Beach by her house and then a day of stamping. 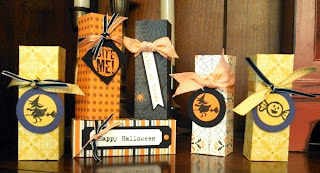 First project we made these cute treat boxes above that Patti plans to hand out to friends. We loaded them with chocolate. 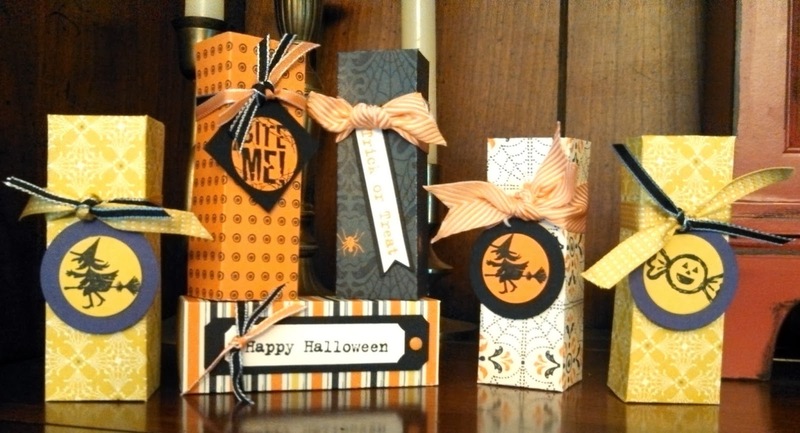 Very easy to make and decorate for any occasion! I will have several other projects we made to show over next few days. 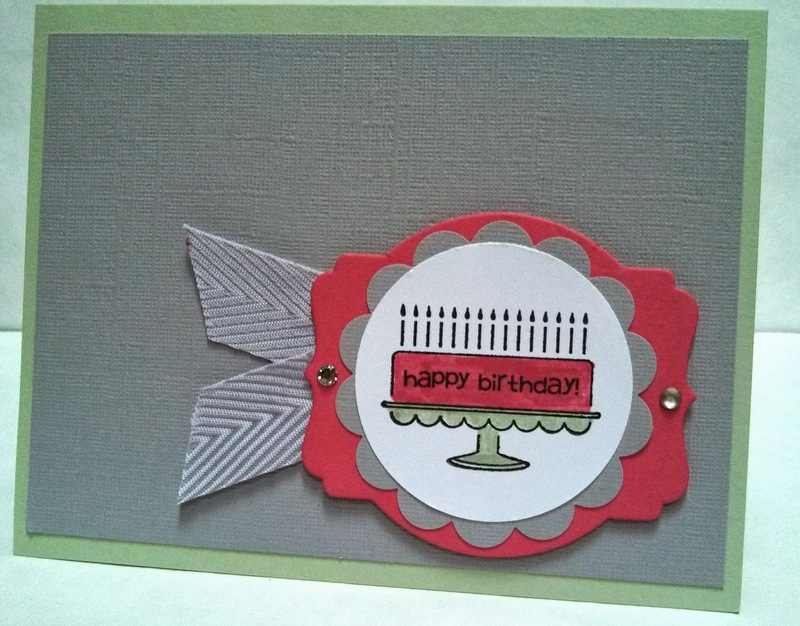 I made this card for one of my sweet 9th grade girls' birthday this week. Her special day falls on Halloween and she does not like that she shares her birthday with a holiday. I wanted it to look very un-fall and un- Halloween like. I had the Strawberry Slush deco label cut and laying there and the slate card stock was also cut from another project. 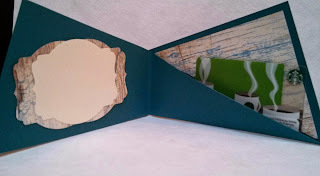 When I looked at my color coach, it paired these colors with Pistachio Pudding....I thought it was weird but it worked! This is one of my favorite cards this season! 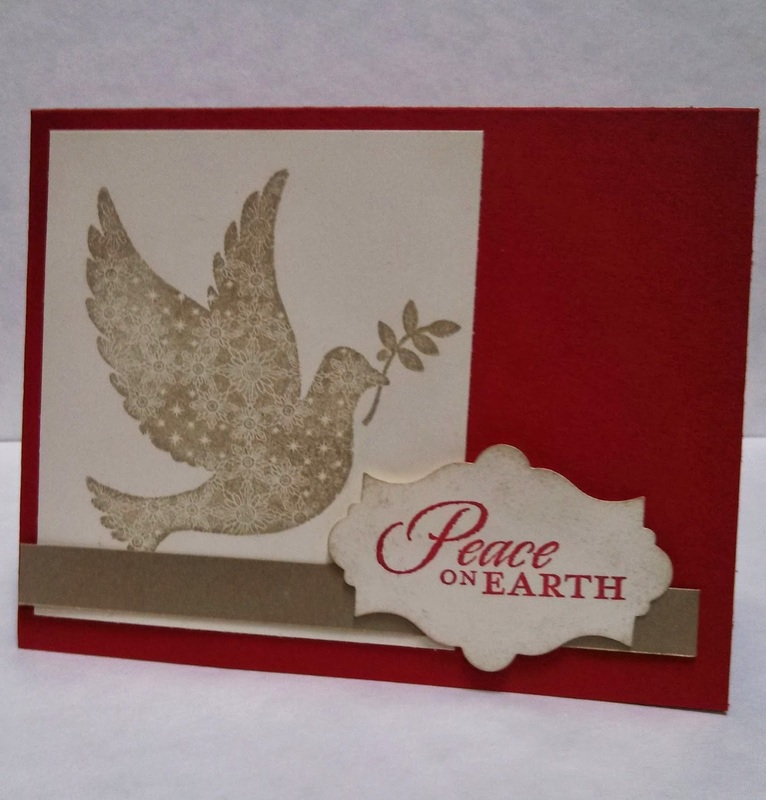 It is the last one for my November Christmas card class! Yay! I got inspiration from my friend and Pretty Pal, Ann Schach who is one of the most talented and creative people I know! 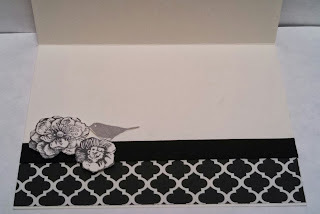 I look so forward to her creations on her blog...stampinchic.com... each week! Hope your Tuesday is inspiring and thanks for stopping by! I cased this card from our Stampin' Up! demonstrator magazine called Stampin' Success. It is great resources for demos with ideas and business tips, etc... I saw it a month or so a ago and I really wanted to make it. I did not own the Everything Eleanor set was has the large shape stamped in Chocolate Chip. 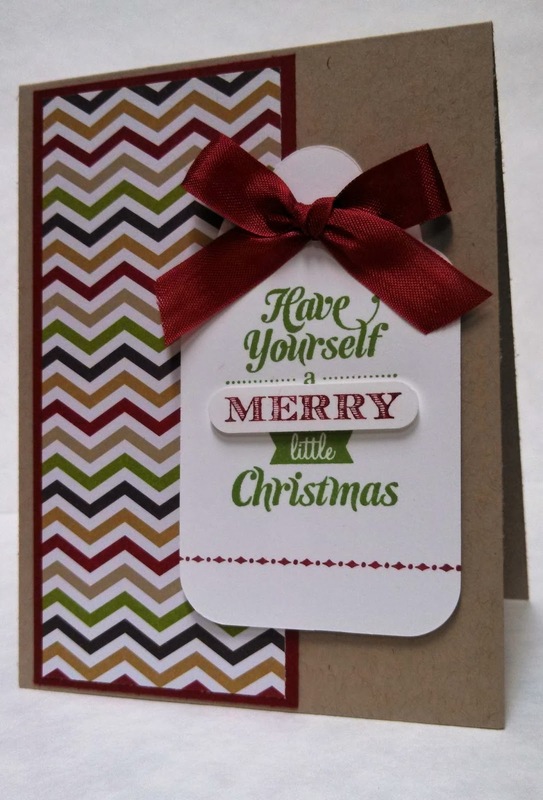 I finally bought it and it came last week and this was the first card I made with it! 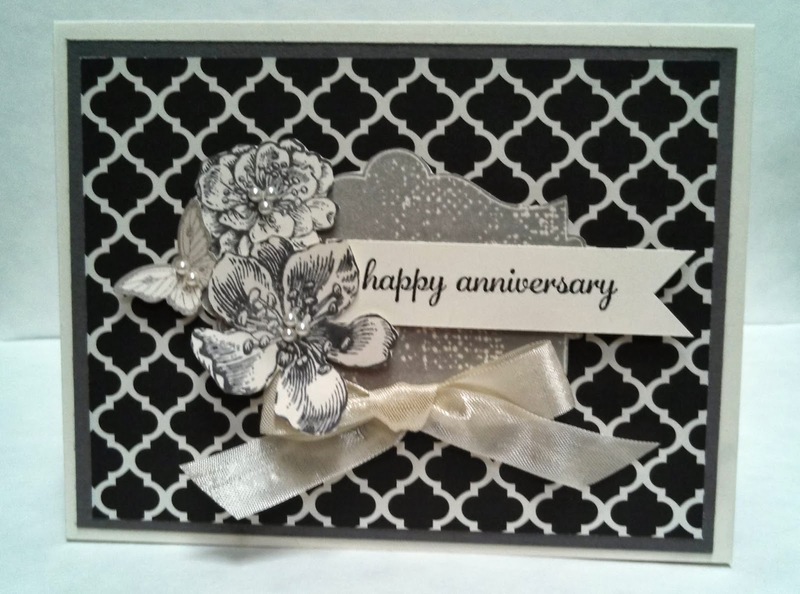 I made another anniversary card with it that I posted this past Friday. I see me using this set a lot in the future and wonder why I waited so long to buy it. But that happens sometimes. I enjoyed a wonderful Brunch at my friend Susan's house on Thursday. I wanted to bring something for her along esp. since she would not let us bring anything for the brunch. She is a wonderful cook! 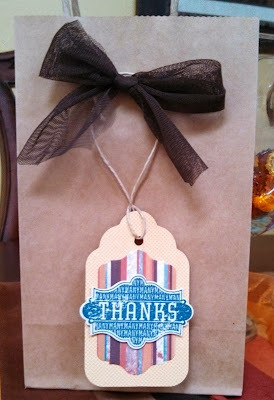 I made the tag so quick going off the colors on the soap bottle. I cased this card from the wonderful Linda Callahan. She is so talented and a Pretty Pal(part of my stamping community). I had a friend contact me to make a wedding card for her in just a few days. 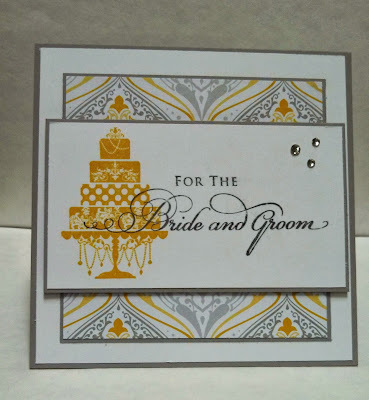 I borrow a few stamps sets from another friend because i do not own really sets for weddings (I need to buy some). 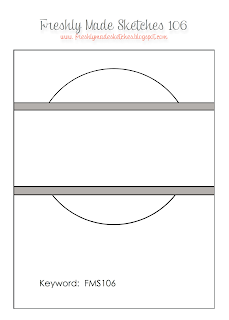 I did not know what I was going to do layout wise or colors. I tend to go black and white since that is formal to me. 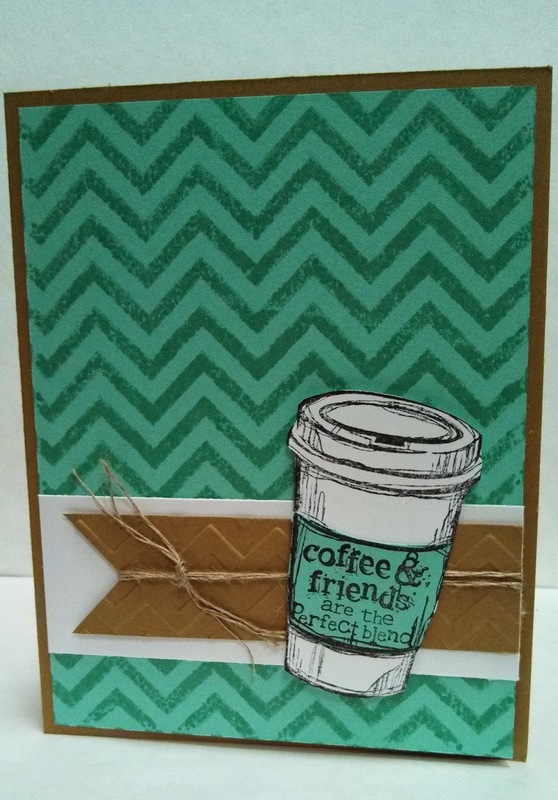 I opened Freshly Made Sketches to look at this week's sketch challenge and prepare to make that card when I saw Linda's card. She used a thank you sentiment but I knew I could make this an elegant wedding card. I have almost gone through two packs of the Eastern Elegance DSP and I will buy more! Happy 1st anniversary to my friends Jen and Gary! I wanted to make an elegant card but I know Jen fav color is gray so decided to incorporate that in with this Designer Series Paper (DSP). I was not sure how would look but went for it and loved the way it all came together. Hope the happy couple do, too! Great Sketch for Pals Paper Arts this week! I wanted to make another Christmas card with Elegant Eggplant and when saw this sketch I first thought DSP for second layer but then I could add more purple (my fav color) if used emboss folder with card stock. I really liked how it turned out. I like this set because it is simple and yet the gifts can but used for Christmas or another occasion! 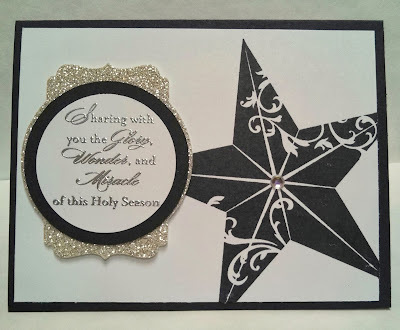 This is a card for my November card class that will be coming up soon...how do I know? Because October is flying by and November is going to be here anytime now! Hope your Wednesday is the best and thanks for stopping by! 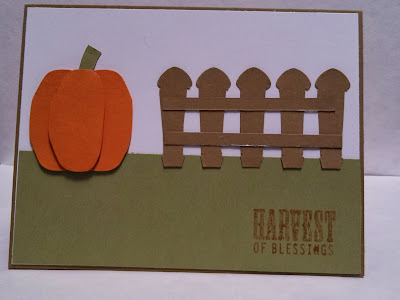 This is from September's My Paper Pumpkin kit. 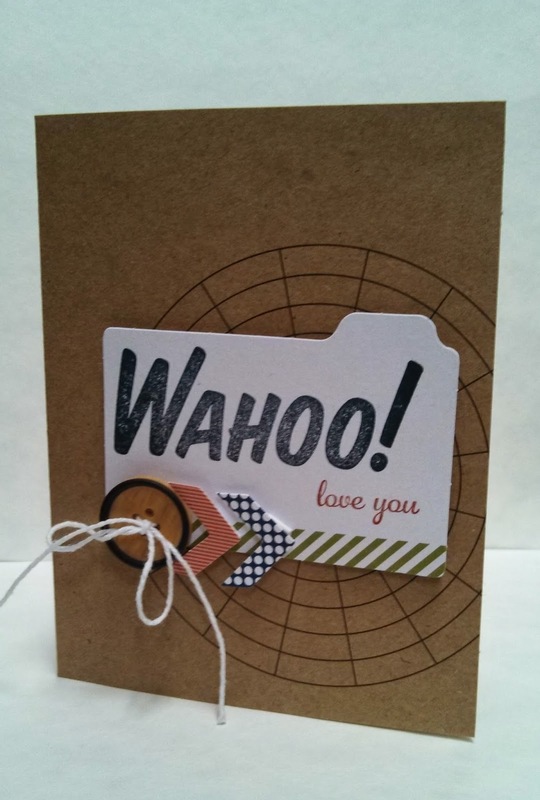 I added the love you to the card because this one is going to my college girl this week. I think she may be getting a little home sick. But she is doing well and having fun! I will be happy to have her home in a Nov. for a week! Enjoy this Tuesday and thanks for stopping by! I looked through samples online for this set to get some inspiration esp. for color. 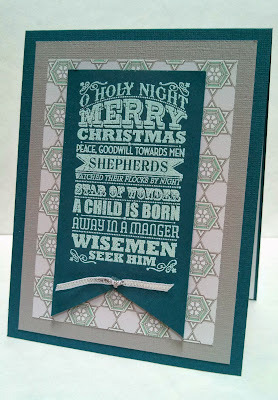 I ran across a card by Justin Krieger where he had embossed the image in Pool Party emboss powder. I said to myself, "Where did he get that from? When did we have Pool Party?" I went to the SU! catty and there it is! Then I looked in my embossing box and found that I own it! Do not remember buying it or ever using it! 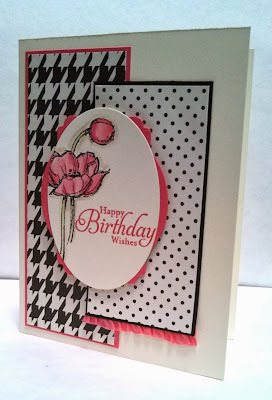 So happy because I love the way it looked on Island Indigo card stock and wanted to use it for my card. Sometimes we have so much, we forget what we have bought and used! Thanks Justin for the inspiration! 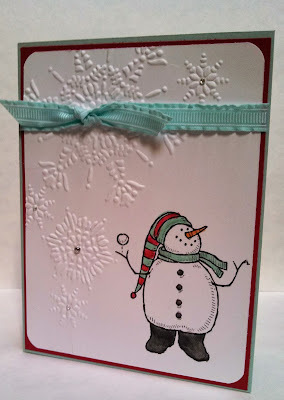 I love snowmen and a couple of my club members reminded me this week about using this set for our November card class. 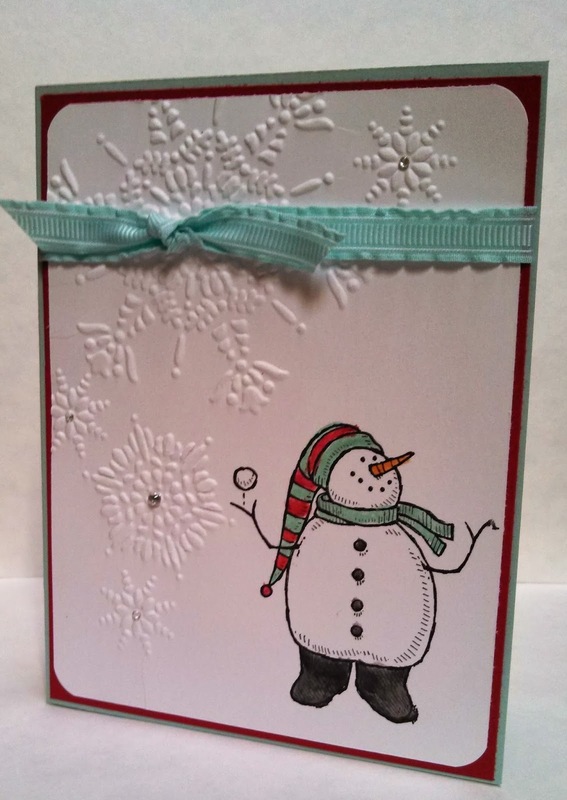 It did retire this last catalog but I will continue to use it because it is snow much fun! I cased this mostly from Alicia Ring, a fellow SU! demo. Enjoy your Sunday! I made decorated this bag with a bow made from Tulle and then made the tag to hang but can be removed to use on another bag or gift. The guest from a card class on Thursday night used these to take their cards home. 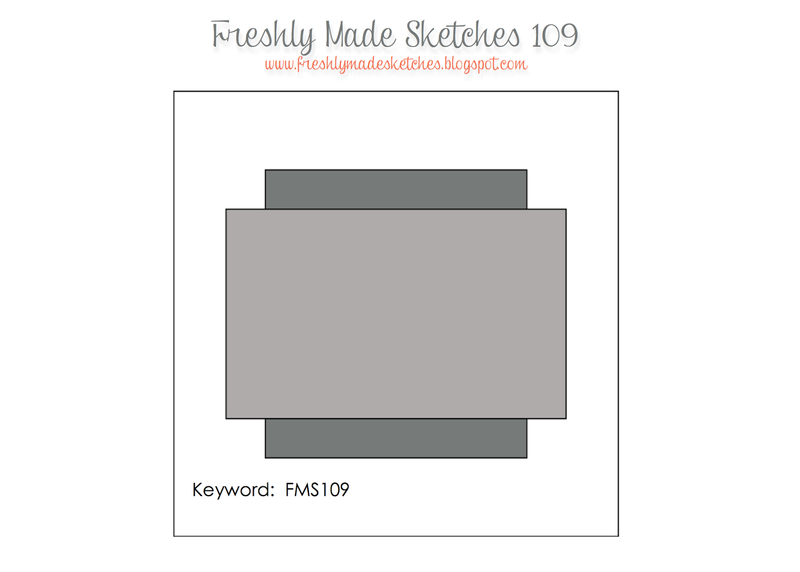 Really nice sketch from Freshly Made Sketches this week. 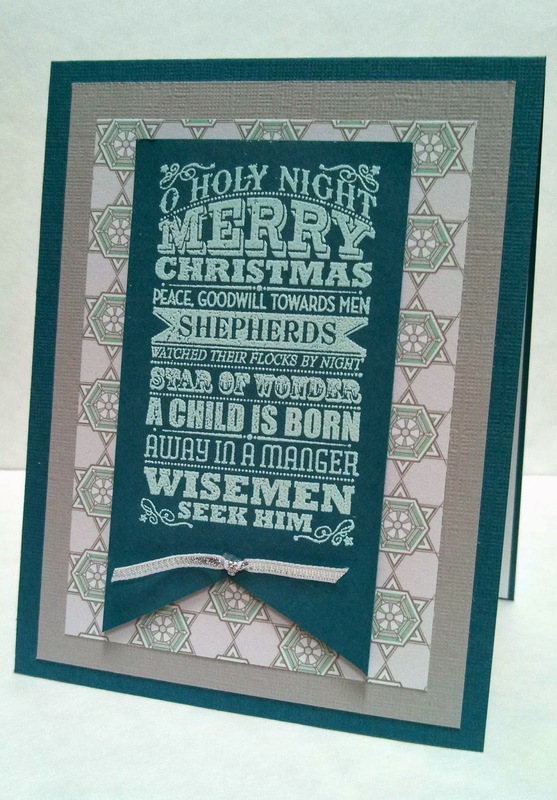 I am thinking only of getting my stash of Christmas cards to increase. I did have several in the box but sold many of them. I usually send out about 43 plus hand out another 8 or so to teachers, etc. The Holly Jolly seemed a little large under the skinny tree but I went with it because I like the tree and the sentiment together. Have a wonderful Friday and weekend! Thanks for stopping by! PPA176 Happy Christmas to you! 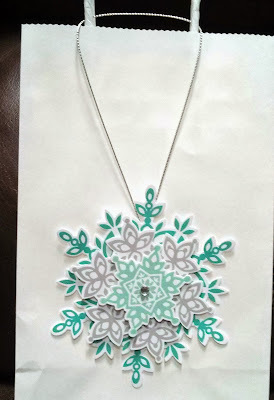 This week's Pals Paper Arts was easy for me as I knew what DSP and colors I was going to use. I envisioned the Winter Frost DSP but also knew I would add a snowflake. I think we will make this card at my next Christmas card class. 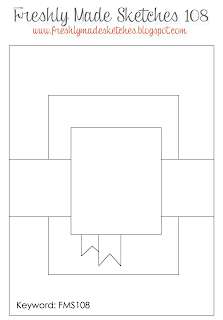 So that means one down and 4 more designs to go! I really am grateful for this DSP. I have used it so much and on my second pack. 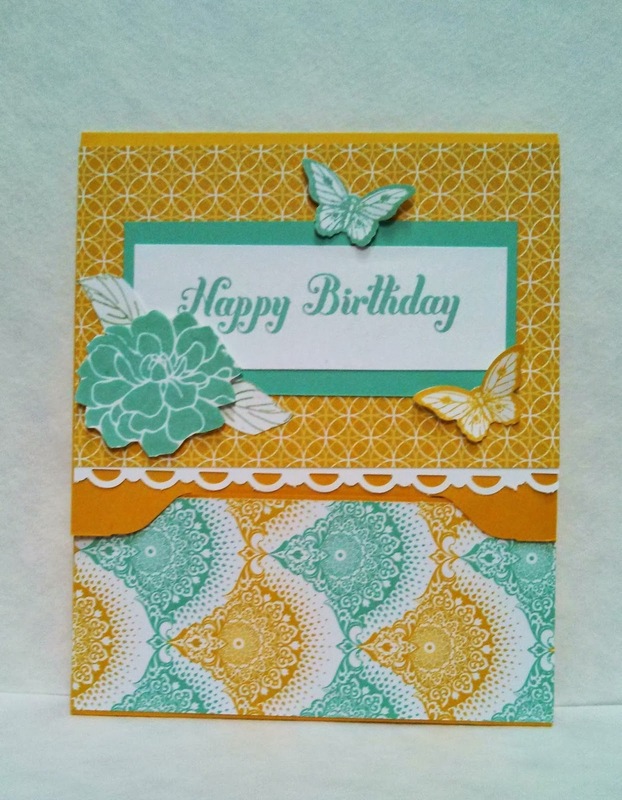 I really like the colors in the DSP and have enjoyed using Coastal Cabana! Something about it makes me feel happy when I see it! 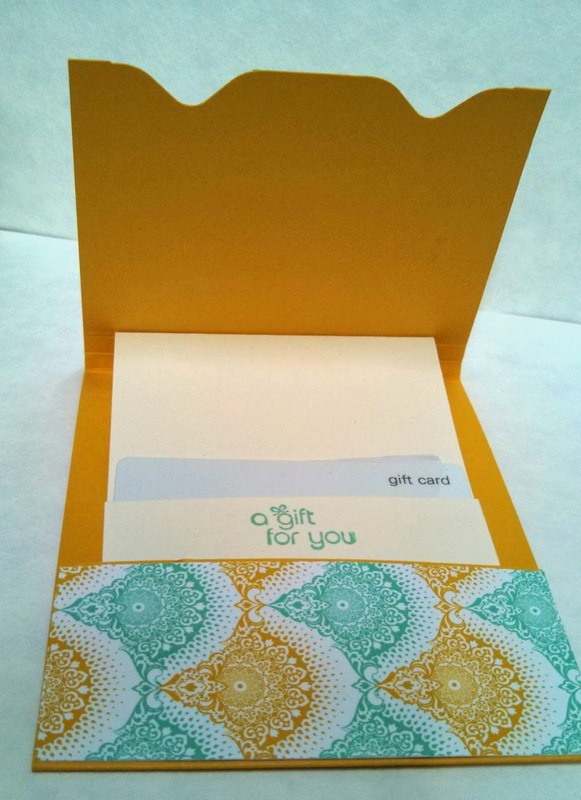 I made a second gift card holder with the envelope punch board this week. I have so many birthdays in October. This one is going to my mom who celebrates her birthday this Friday. 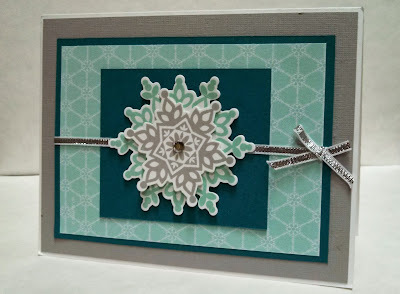 I have few more cards coming up in the next week I have made and will make from the envelope punch board. I am finding it to be very handy for more than envelopes. Hope you have a great Tuesday and thanks for stopping by! Last card I designed for an upcoming card class this Thursday. I knew I wanted to use the houndstooth design for the Modern Medley DSP paired with another design from that same DSP pack. I just did not know what other color to use that was not red. 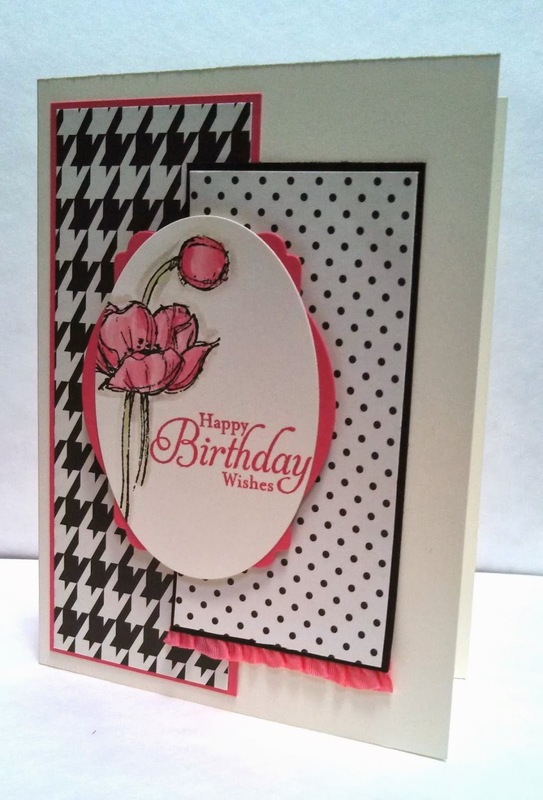 I have already made some cards with Cherry Cobbler and this black/vanilla paper but then thought of it being Breast Cancer Awareness month and Strawberry Slush really looks great with this paper. I really like this stamp set because the guest can choose to stamp a birthday sentiment or thank you or sympathy. 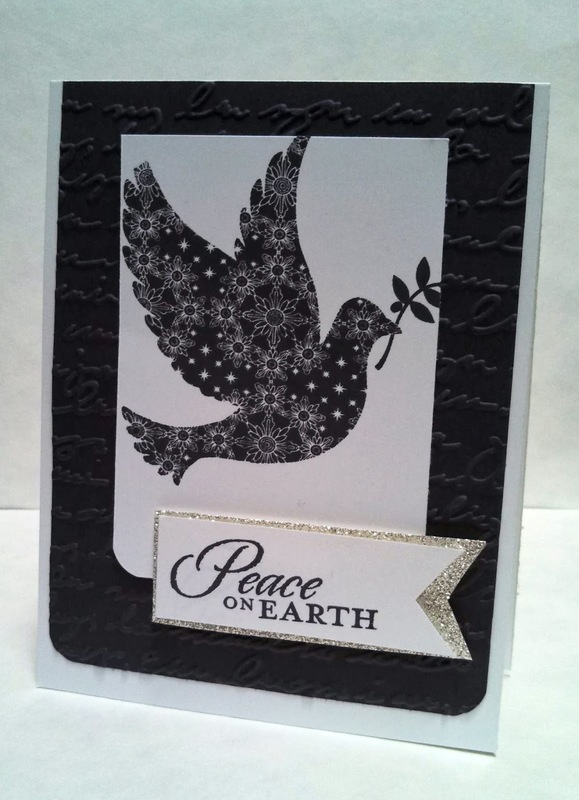 I cased some of this card from fellow demo Bernadette Bliss. I really liked the layers. 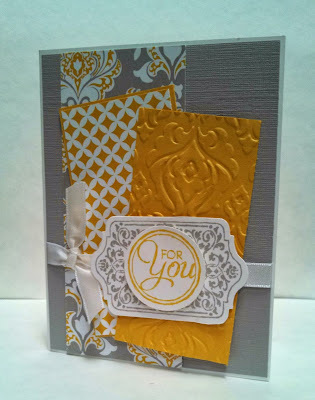 I was thinking of my friend and club member that loves the yellow and gray together. 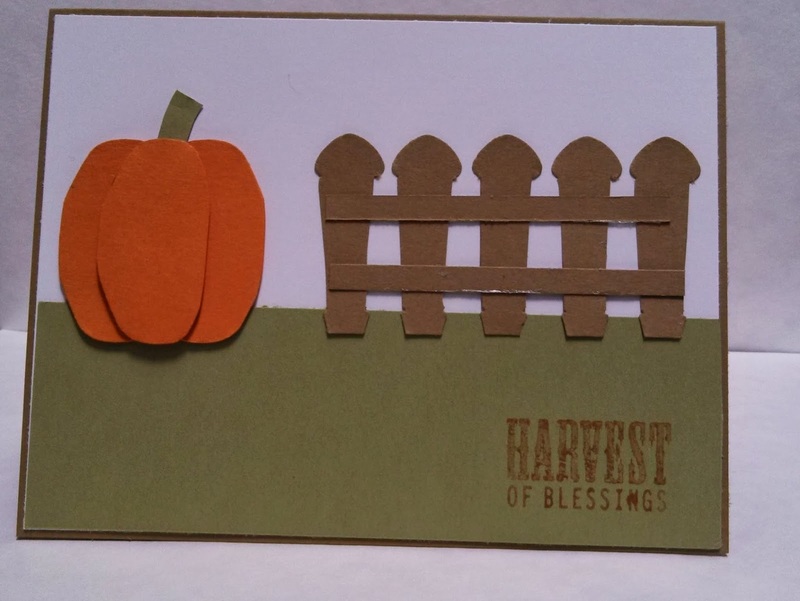 This is another card for this week's card class at a friend's house. 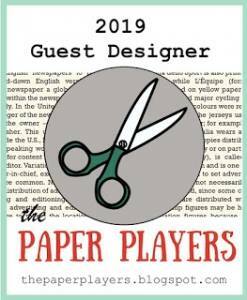 Looking forward to stamping with some people I have not seen in a while and some new faces. 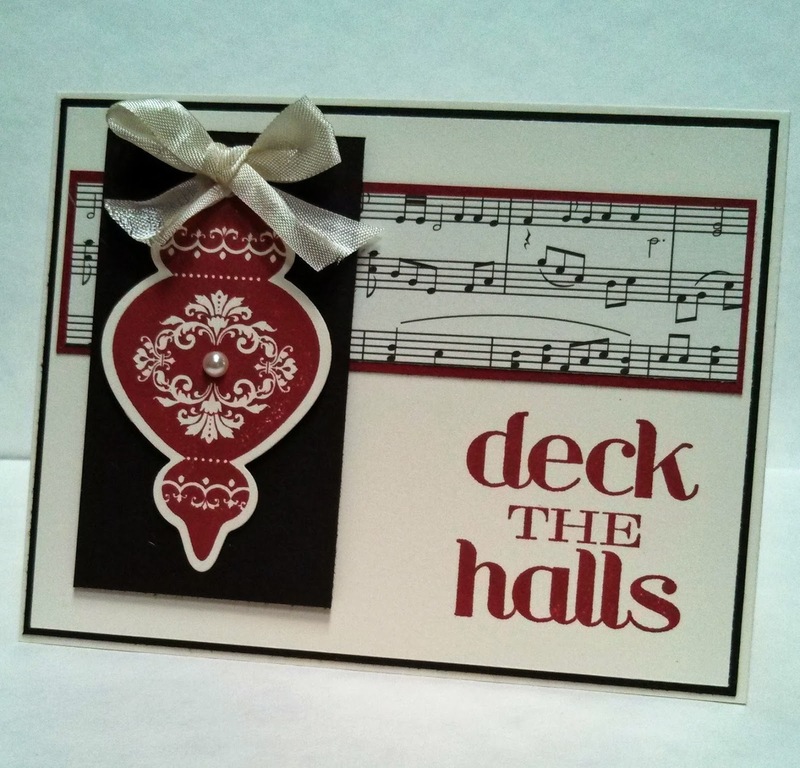 I designed this ornament for the gift bags for my card class this past week. I had 12 ladies come and make Christmas cards and they carried their cards home in the gift bag. 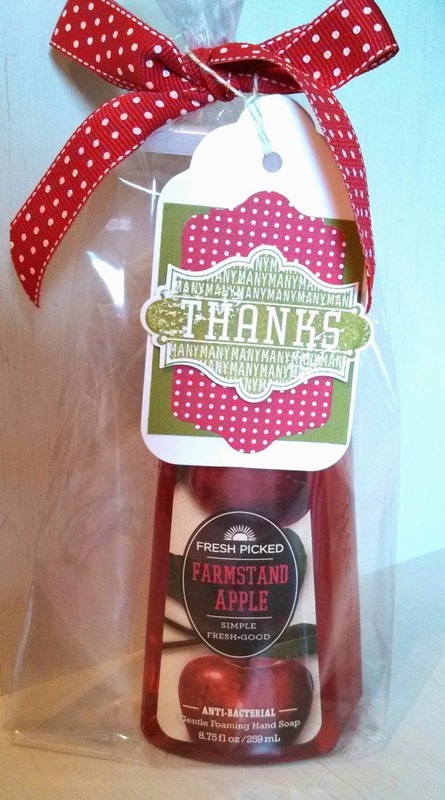 The ornament was removable so they could hang for decoration or use as a gift tag. I like things that one can reuse and enjoy again! Hope you have a fabulous weekend and thanks for stopping by! 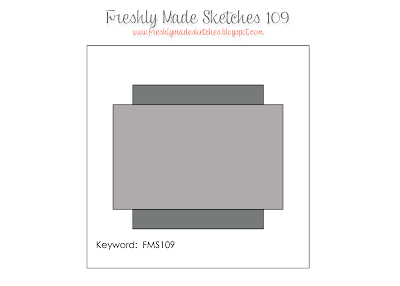 New sketch from Freshly Made Sketches. I knew I would grab a flower and do a birthday theme. Of course, Wish Big could work for several occasions. I really like this color combo from one of SU! 's Designer Series Paper collections....Eastern Elegance! 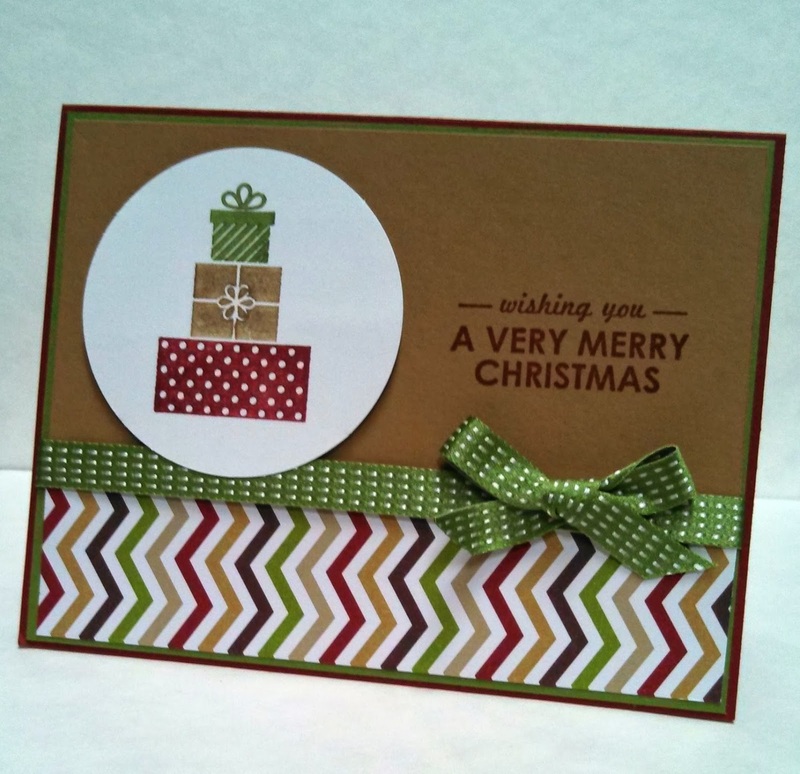 The card measures 4" squared. Another color challenge...this one really stretched me this week! I do not care at all for Always Artichoke or So Saffron. I can not even tell you the last time I touched either of these colors. 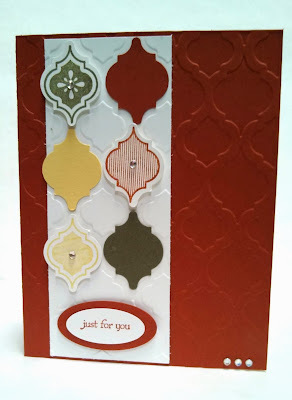 Cajun Craze is great with the right colors! 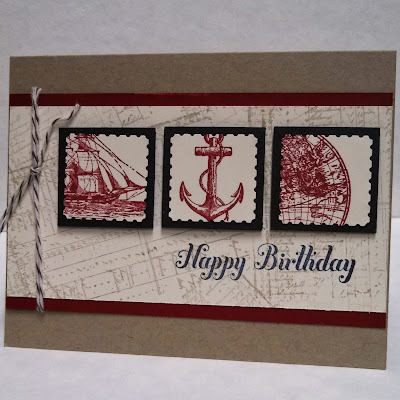 But I prevailed and pulled a great stamp set I have been meaning to use lately. I made a twisted gift card holder for a friend away at college. 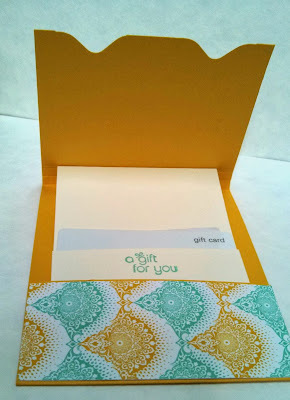 I wanted to surprise her with a Starbuck's gift card since it is her fav place to hang out. 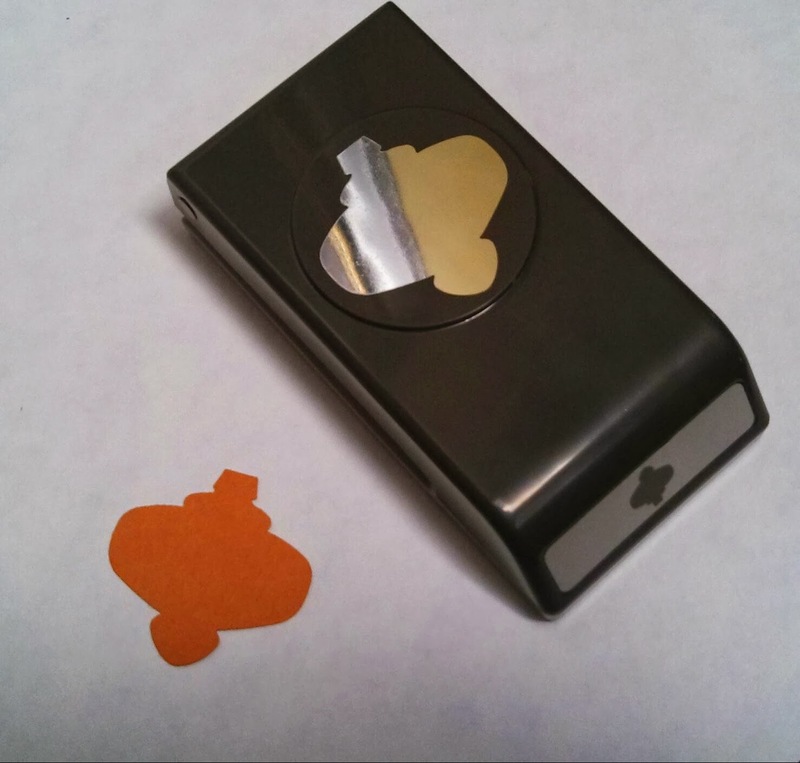 I wrote a message on the inside left where I cut a deco label. 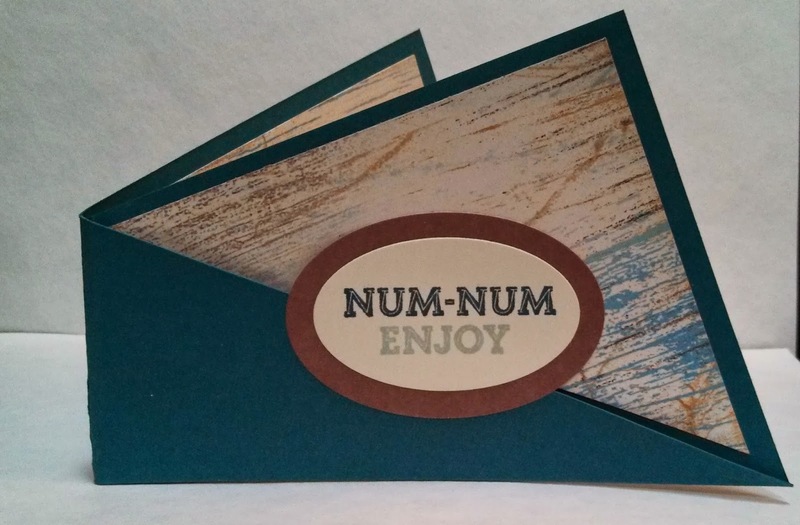 The Num-Num saying does come in handy! 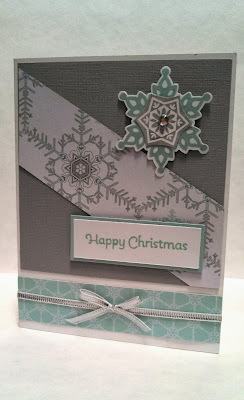 Looking forward to my Christmas Card classes tonight and Thursday night. This is one of the card I designed for the class and I really like the gold and Real Red together. I knew I would love this star as soon as I saw it. It is offered in SU! selection of single stamps this season. It is stamped in Elegant Eggplant and looks so much more rich than in photo here. 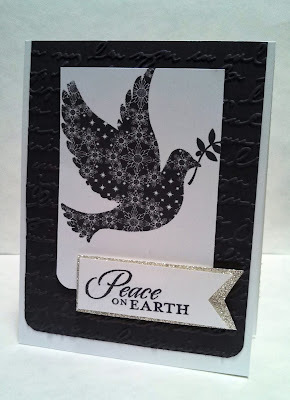 I embossed in silver the words and then added some silver glimmer paper to make it pop! I still love the colors in the Winter Frost DSP. 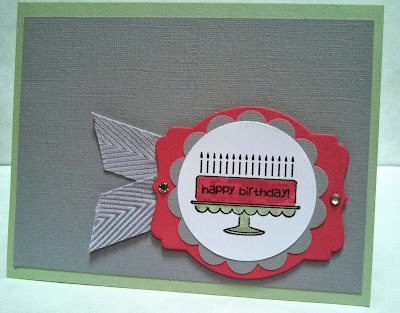 The Smoky Slate textured card stock and the shiny silver ribbon add a lot of richness to the card. 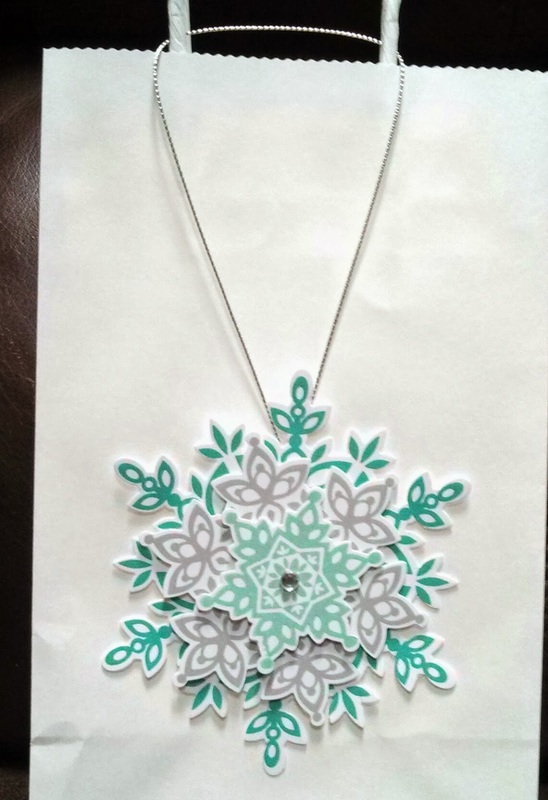 Each snowflake is popped up and a little bling added to center. I really am thankful for the matching snowflake die cuts and using the magnetic platform with the dies is the bomb! 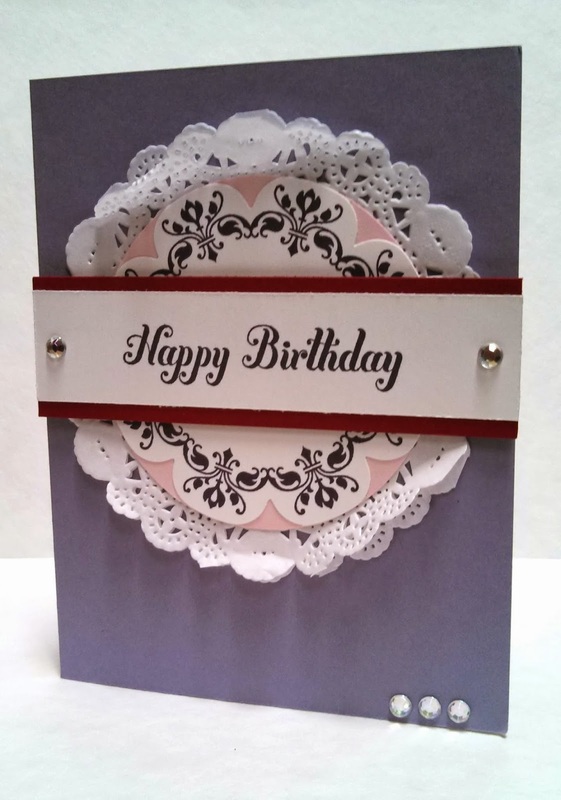 This is a card I have made for a class later in the month. 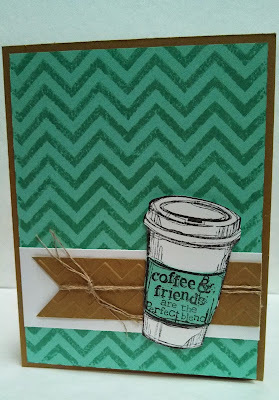 Love using the Positively Chevron background stamp. 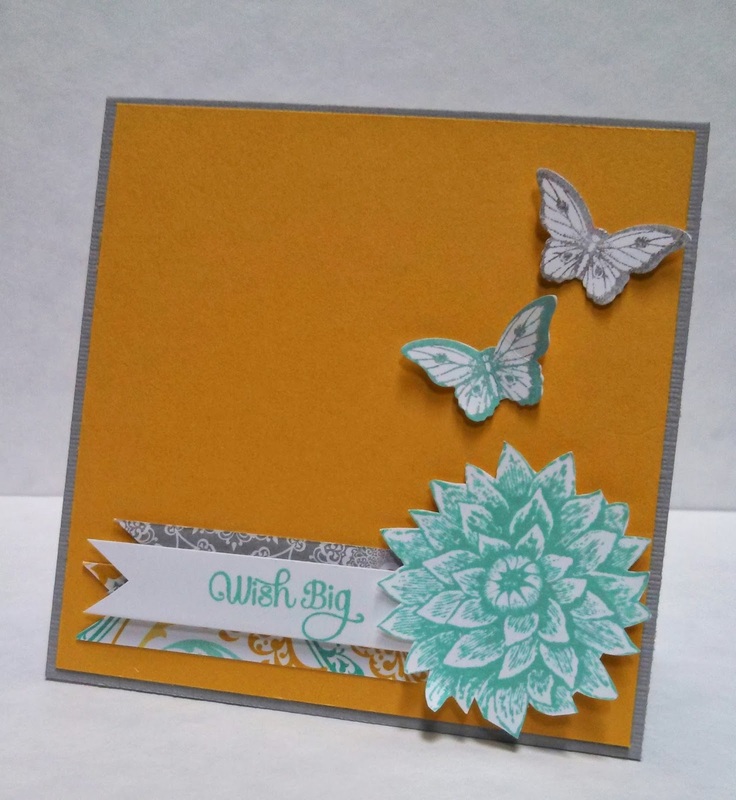 This is stamped in Coastal Cabana ink on Coastal Cabana card stock. It still has a wow! effect. Hope your day is a great one and thanks for stopping by! FMS 106 A Happy Wisteria "Wonder"ful Birthday! Great Sketch by Amy O'Neill this week. I thought of the doilies right away before seeing the other entries. 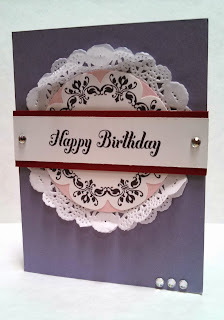 I had my Wisteria Wonder out from another card design so paired it with Elegant Eggplant, Cherry, and Pink Pirouette for a great color combo! Hope you enjoy your Friday! Thanks for stopping by! 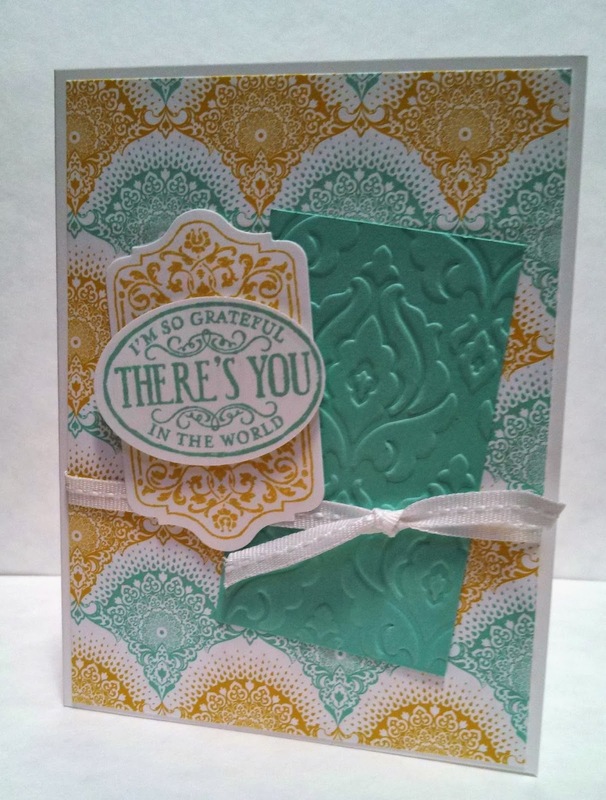 Thank you Debbie for selecting my card for September 26th PPA Pick PPA 173!!! Hope you are inspired and have a wonderful Thursday! 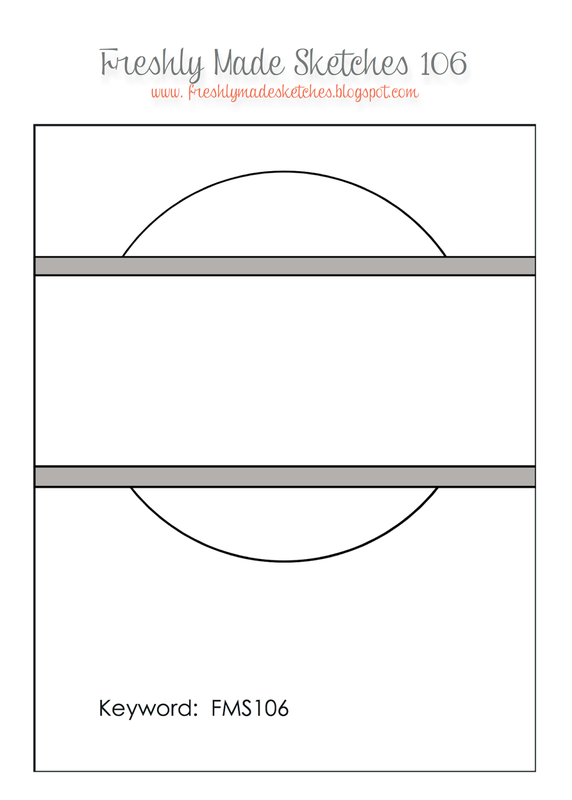 This is my other masculine card for a card class in a few weeks. I love this set and use it often! 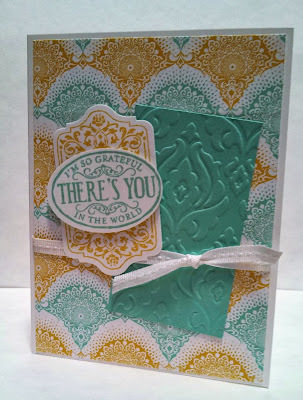 I cased this card from one of my stamping Pals from a swap at Convention this year. I now do not have the name of whom I cased from but when find it, I will give credit. 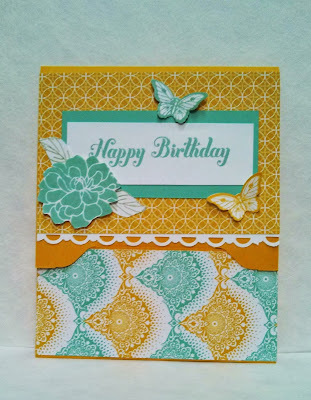 I stamped the background with the chart stamp in the set and made my own designer paper. 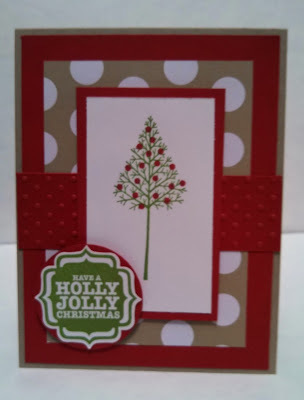 A simple card for next week's Christmas card class. I love the Cherry Cobbler seam binding ribbon and so glad it has stayed around! I used the word window punch to highlight in Cherry the Merry. Hope you have a great Tuesday and happy October 1st to you!